We lost a great storyteller today. Oliver Sacks was that rare combination of scientist, doctor, and writer—a neurologist and author who wrote about his patients’ unusual conditions. His most famous book is perhaps “The Man Who Mistook His Wife for A Hat,” and he wrote many others since, on a multitude of topics spanning case studies from color blindness to amusia. I have only read sections of his work, bits and pieces from books read off the shelf at Barnes and Noble, and his articles, especially recently, when he was describing his battle with cancer. But my fondness for his writing overwhelms the number of his words that I have read, because in each of his pieces I am sucked into the patience of his thoughts, his endless curiosity, and his deep sympathy and sensitivity to the beauty of nature and people around him. We have lost a great storyteller today. When Sir Terry Pratchett passed, tens of friends and acquaintances echoed the news on social media, and today too I’ve seen messages from people who, like me, have never interacted with Dr. Sacks save the investment of reading some of his many words. Why is it that we mourn storytellers; why is it that we read? I’m a voracious reader, but many of the stories I read are simplistic—love stories, stories with easy templates and easier, happy endings. I’m an escapist reader, as well: I like stories where a character departs on an adventure in a life completely separate from my own. But my love for stories like Dr. Sacks’s feels different. When I pick up a book about homelessness, when I pick up a book for its empathetic description of someone with complete retrograde amnesia—that process is far more effortful; it’s inspired by a different yearning. It is, I feel, about reaching into the mindscape of someone who could be me, but isn’t—reaching for an understanding of someone who I might encounter, in the hopes that I might have enough empathy, enough openness, to recognize their humanity and similarity to myself. I’ve wished before that every person in the world was their own marvelous storyteller—that we each had the capacity to write our own stories, paragraph by paragraph, morning by morning, slowing down for dialogue in important moments and speeding through weeks without character development or events that significantly influence our paths. Then we could read each others’ stories, and take the time to struggle through every difficult conversation, to know and rejoice in each other’s goals, to experience carrying each other’s pain. I’ve been told this is a silly idea. Why would you want to read someone’s story when you could go through the wonder of meeting them and pulling their stories out, one at time, until you could craft together their whole? And besides, we’re not all great writers, anyway. But I say that stories are piecemeal too. Good writing doesn’t immediately shove the entirety of a character at you—instead, the reader discovers their characters as the pages go on, as the behaviors add up, as histories are slowly revealed. Great stories are piecemeal too—just thoughtful piecemeal, each of a character’s idiosyncrasies pulled out carefully to create the most beautiful possible whole. Sometimes, people will say they don’t write because they don’t have anything important to say. Nonsense: everyone’s story is important, is beautiful and necessary and connected. …If told by the right person, if told by a great storyteller. Because we aren’t all storytellers. We don’t want to hear about every second of every individual’s life—we want to hear about the cliffhanger moments, the making of a life-changing choice, the themes that drive their behavior, a dazzling moral dilemma. Or we might want to be even further removed than that. Perhaps we want a single dimension of a character, to understand how that one element defines their life’s circumstances. Perhaps we want a snapshot of a life, to be thankful for what we have or to urge us to drive forward. Bill Hayes, Dr. Sacks’s partner, is a beautiful storyteller. He takes and posts pictures of people in the New York City streets. He scrawls fragments of his conversations with those strangers beneath each portrait. In each post, he finds the important message within each conversation; he highlights the situation or the words, relates stories from people-different-from-us-that-could-be-us in the narrative structure of our own cares. I would struggle to write those stories—I’d feel uncomfortable as a woman to ask for them, I could fail to draw out what’s important during or after, I perhaps don’t have the right sort of voice or empathy to tell anyone’s story but my own. We aren’t our own marvelous storytellers—great writers are far too rare for that. Those extraordinary people with the inclination, power, ability to make sense of the world through writing, to find the self in each individual, to share others’ stories in a way that will let others understand. I don’t know Dr. Sacks, and am so sorry for those who personally feel his loss. For those who are on the outside, reading the story of his life he chose to give us: thank you, Dr. Sacks. God bless. I’m going to be trying out new writing styles for the next few weeks, so I’d love commentary on what you like while I try and figure things out! (Really: I am at maximum susceptibility to constructive criticism at this moment!) 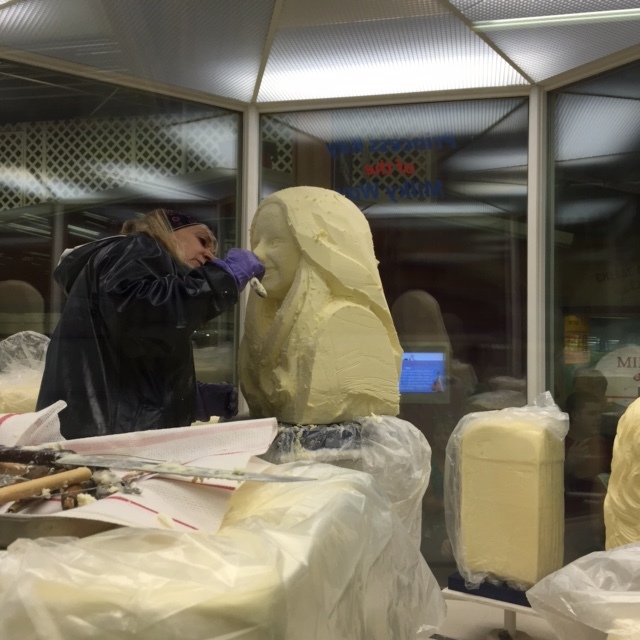 In Monica-news, a whole bunch of administrative things have been happening :). There were some issues with my visa, and with housing, and then lots of forms. I’m always amazed by how much work organizing one’s life is– I can’t imagine doing it for more than one person! But I’m psyched, have met some wonderful alums, and am so much more prepared for Cambridge :). 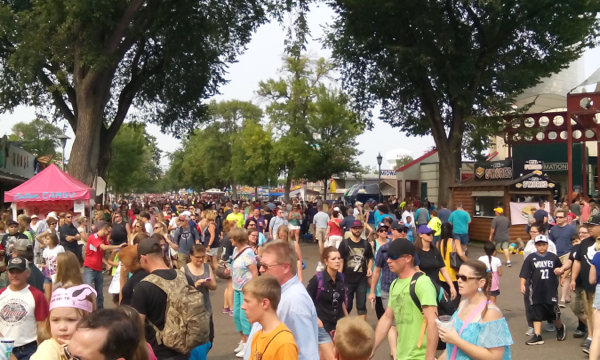 Yesterday I went to the Minnesota State Fair for the first time in four years, which was an absolute treat. 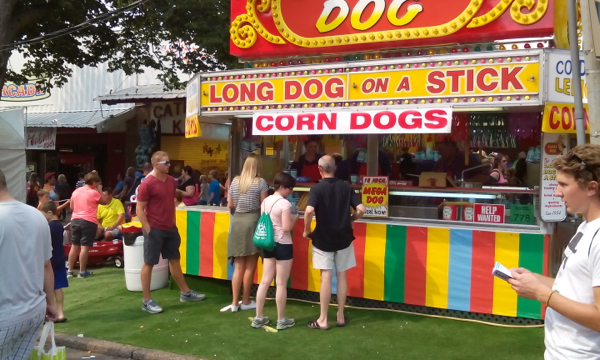 The MN State Fair is divided up into several sections, of which the most important are: deep-fried foods on sticks, miscellaneous stuff, rides, and animals, in that entirely objective order. 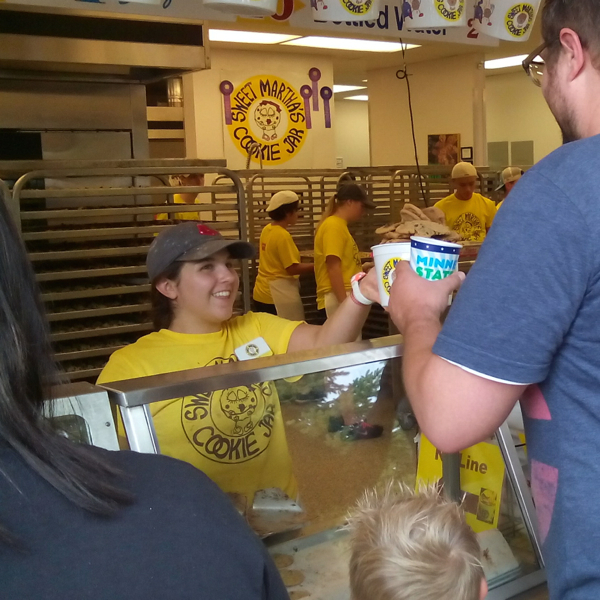 I’ve attached pics of the Sweet Martha’s Cookies building– you can buy an entire tub of cookies for $16, and then you wander over and pay for unlimited-refills milk for $2, and you’re set for the day. 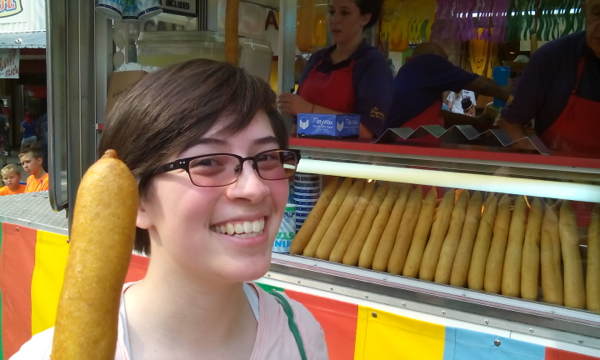 Or not, because we also ate a disproportionate amount of cheese curds, and I’ve included a pic of Nicole with her foot-long corndog. 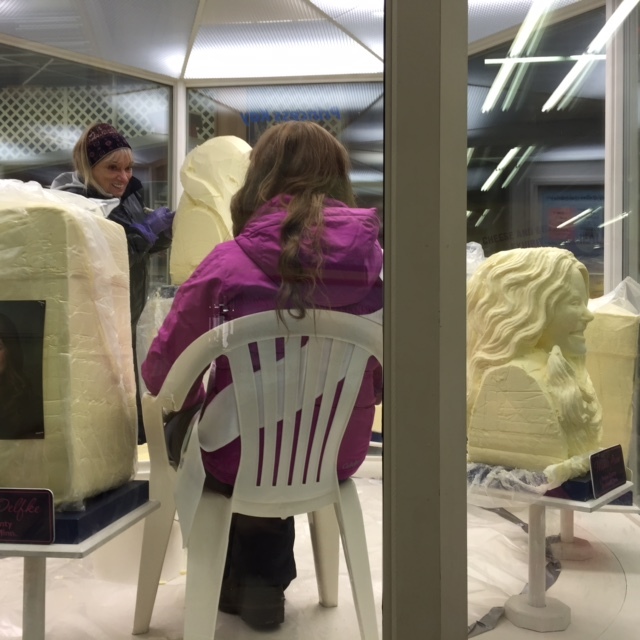 Finally, for a “miscellaneous” pic, I’ve attached pictures of the Princess Kay of the Milky Way candidates, the young women chosen as candidates for Minnesota’s annual dairy princess. 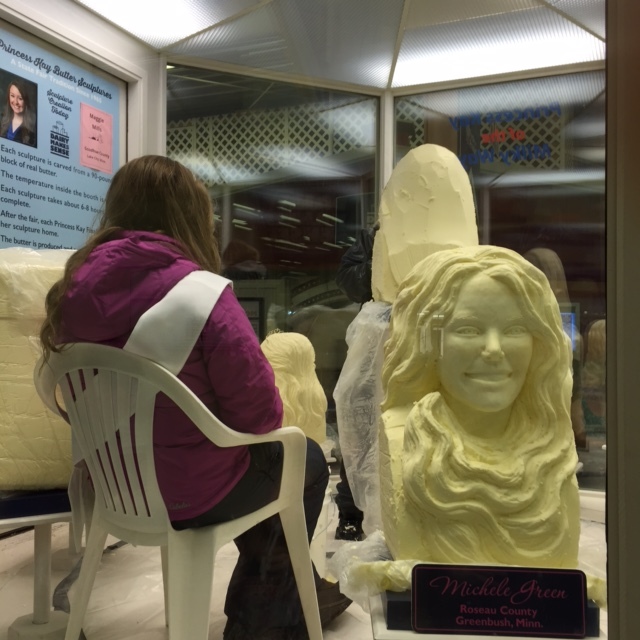 Each candidate gets to have their head carved in a massive block of butter, which they then get to keep. Minnesota is awesome, man, and family is awesomer. Hope you’ve all had good weeks, and please feel free to comment– I’m trying to feel out where the blog is going to go, and it would be fantastic to get feedback. Thanks so much for sticking with me this far, readers– love you all :). This is what a tub looks like. They taste even better frozen! Nicole and dad– mom stayed home because there were no chickens this year (there’s always livestock, but there were no birds this year because of an outbreak of the avian bird flu). Notice that the model’s in her winter clothes? It’s 40 degrees in the box. We’ve got all the winter gear. 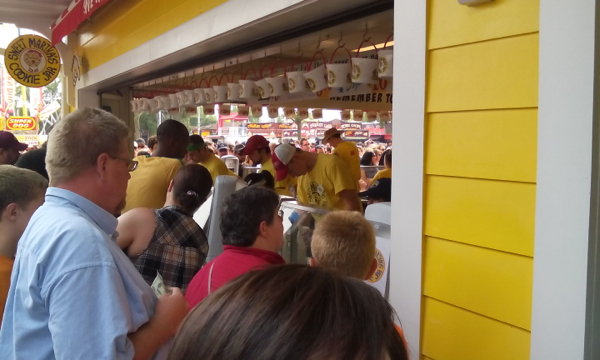 I love fairs :). Masses of humanity.